For the vast majority of the time, our boiler is something that we take for granted. As long as it keeps on working properly and we have a constant supply of hot water and heat as required, there is little to be done in the way of maintenance, apart from the annual check. However, as with any piece of equipment, things can and do go wrong from time to time - and an unfamiliar or unexpected noise is often the first sign. Such noises can occur even if everything seems to still be working properly, but a noisy boiler should never be ignored. For many people, they can be very worrying. Even the smallest of noises can also cause problems such as frustration and sleeplessness, which adds to the stress. So what are the common reasons why your boiler is making a noise and what can you do to solve the problem? Let’s take a closer look. Sounds can sometimes be misleading, especially inside houses. The first step when faced with a noise in the system is to identify exactly where the sound is coming from. Because sounds can travel and echo through the heating and water system, it is important to first establish if it is actually a noisy boiler, or a noisy radiator or central heating pipe, each of which can have different causes. If you are happy that the noise is coming from the boiler, then the following steps will help you. Many modern boilers now come with digital displays which include error codes. Before spending time to diagnose problems yourself, familiarise yourself with the product manual as this could save valuable time. If you don’t have the original manual, an online search with the make and model number can often find an online version. 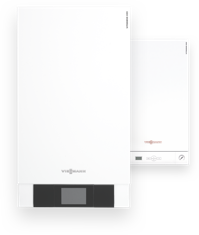 For Viessmann boilers, most possible fault codes can be found on our dedicated fault code identifier page. However, be aware that not all problems will generate an error code so the following steps may still be necessary. Turn on the boiler and check the water pressure (see below). If you are unsure about bleeding the system or encounter difficulties at any point, it is advisable to contact a professional at the earliest instance. If the water pressure is too low, this may be the culprit of your gurgling noises. Your boiler will have a pressure gauge, also known as a manometer, located in the area where the pipes are connected to the boiler itself. Most modern pressure gauges will be marked with the correct pressure level, although you may need to consult the manual. If it is too low, then increase the pressure until it is restored to the correct level. This may require a topping up of the water level. If the noises continue after you have taken the previous actions, there is a possibility that the problem may lie in the circulation pump. In most cases, the noise will be caused by this pump operating at an excessive speed. If the boiler has an option to slow it down, this may solve the problem. It may, however, be necessary to have a trained engineer perform this task. A boiler that begins to make loud ‘whooshing’ noises and vibrate excessively can be very scary, however the actual cause may be quite simple to diagnose and fix. Whilst there is no immediate danger, allowing the problem to persist can cause further damage so immediate action should be taken. The most frequent cause of a loud whooshing sound is a blockage to the air intake. Check the external pipe on your building to make sure that there is nothing blocking it and remove any obstructions such as foreign objects or fluff. If you place your hand over the vent, you should be able to detect a certain amount of air movement. A blocked air filter is now one of the most common causes of boiler problems. The air filter in a boiler is not unlike the filters you will find in a vacuum cleaner or car. If the air filter is user-serviceable, remove it and clear it of any dirt build up with a vacuum cleaner or dry brush. It may be necessary to engage the services of a professional for this step. A buzzing or whining sound coming from inside your boiler is a genuine cause for concern that is typically caused by worn pump bearings, a defective burner or vibrating fans. Unfortunately, these are all problems that should only be diagnosed and remedied by a qualified professional. Action should be taken sooner rather than later to prevent further damage. Remember that you should only perform routine maintenance on your boiler if the manual instructs or advises you to do so. These tasks always involve accessible areas and will never require the use of special tools to access any sealed parts of the equipment. If you are not confident or have attempted to perform such tasks without success, then you should contact a Gas Safe Registered engineer. You may also wish to check if the engineer is accredited or has been trained by your boiler manufacturer.